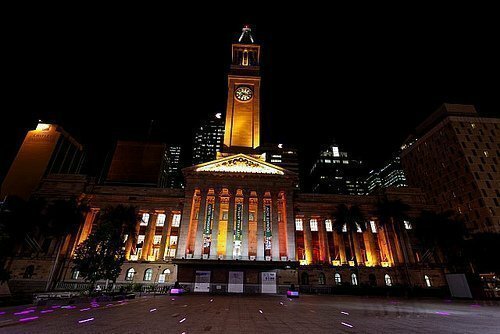 If you are in Brisbane city, you must see the clock tower of Brisbane called as Brisbane City Hall. This heritage listed building, once the tallest tower in Brisbane, is one of the major tourist attractions in Brisbane and attracts many tourists each year. Locals also call it the ‘heart of Brisbane‘ because of its proximity to King George square, central station and queen street. It is located on Adelaide street, Brisbane city, adjacent to King George Square and often called by different names such as city hall, clock tower of Brisbane, Brisbane town hall or Brisbane clock. The building was built between 1920 and 1930 and since then it has gone through various restorations for different reasons. The design of the building is based on the Italian Renaissance style. The four clocks with faces on each side of the tower are the largest in Australia. Inside the hall is a beautifully designed auditorium with several reception rooms and the style of the auditorium is based on the style of Pantheon, Rome. It has been the main venue of many popular events in Brisbane. Every year, the Christmas events are held at King George Square next to the City Hall and hundreds of people gather around the clock tower to celebrate the event. Some other events that are hosted in this Brisbane’s top venue are Film festivals such as Asia pacific film festival, Pageants, Receptions, Graduation ceremonies, Citizenship ceremonies, orchestral concerts, and political meetings. Tours of the city hall are available and as part of the tour, you will get a chance to see how the clock tower operates, get to know the history of the tower and most importantly, you get to see the Brisbane museum. You will also be taken to the top section of the tower from where you can see the views of Brisbane city. So, if you are visiting Brisbane city or looking forward to an event in Brisbane, this is the place you need to keep in your list of things to do in Brisbane city.